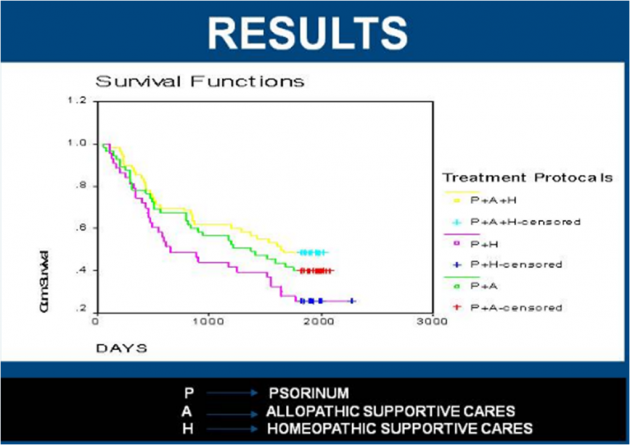 Psorinum therapy – homeopathy for cancer? These papers , (pdf) have recently been pimped around twitter by various homeopaths, apparently as proof that a homeopathic remedy can cure cancers, including the very nasty pancreatic cancers. Paper 1 (published in a sensible-looking oncology journal) is just an abstract from a meeting, and paper 2 (published in Evidence-Based Complementary and Alternative Medicine) is the actual paper with all the juicy details – but they essentially detail the same study. Taken on face value, the results are pretty amazing, with 5-year survival rats of around 40% for patients with stomach, gall bladder pancreatic and liver cancers (paper 2, table 3). Compare these with current 5 year survival rates for stomach and pancreatic cancers of roughly 12% and 2% respectively. So, if kosher – these results would be a fantastic addition to the arsenal in the war on cancer. … the studies were conducted without any controls whatsoever. The mind boggles. Why bother going to the effort of a 5 year study, and not including a control arm? Whether it be an ‘untreated’ arm, a placebo arm or a comparison against current best practices and therapies, a control arm would have increased the viability of this study no end. Even if they failed to recruit any more patients, and just split the patients into to two randomised groups with 20-odd patients in each arm, the power and impact of the study would be massively enhanced. To not control anything is just a massive fail. This massive fail is then compounded by a failure of peer-review at eCAM. Did the reviewers not ask themselves where the controls in this study where? However, this was published in eCAM and this is clearly labelled as a prospective study – maybe I am being too harsh. However, for those totting this paper as evidence for homeopathy curing cancer, let’s make this absolutely clear: the only conclusions that can be drawn from this study are that the study is ultimately a waste of 5 years and is utterly meaningless in it’s current form. It should have been designed properly 5 years ago, and it should have contained some sort of control arm, and should have been properly randomised and blinded. It is perhaps telling that in this final sentence in the paper, that the authors mention “detailed molecular, pharmacokinetics,and pharmacodynamics studies.” That use of the word ‘molecular’ is the only appearance of the word molecular or derivatives thereof in the entire paper, maybe unsurprising given that this is a homeopathic study. Of more note to people with an interest in molecular mechanisms (myself included), is the fact that the dilution factor used in the study is only 6x. So, 1 in 1,000,000. Wait a minute! That’s cheating! There is an outside chance that Psnorium 6x actually has “something” in it! Let’s assume for a minute that the results are genuine, and Psnorium 6x has had an effect on these cancers. The fluid from scabies blisters will likely contain serous fluid – but depending upon the exact contents of the blister it could contain all manner of biochemical goodies. Active mites on the surface of the HSE induced secretion of cutaneous T cell-attracting chemokine, thymic stromal lymphopoietin, interleukin (IL)-1alpha, IL-1beta, IL-1 receptor antagonist (IL-1ra), IL-6, IL-8, monocyte chemoattractant protein-1, granulocyte/macrophage colony-stimulating factor, and macrophage colony-stimulating factor. So, biochemically speaking, scabies blister fluid likely contains some very interesting molecules, some of which may have an effect on cancer cells. Oral administration of Interleukins has been shown to have physiological effects in some studies, and cytokine therapy is an avenue being explored in the fight against cancer. Take the scabies blister fluid. Give one-third of it to a homeopath, get them to make up their remedies as usual, with all the serial dilutions and succussion. Give another third to a competent postgraduate student. Get them to make a 1 in 106 dilution of it, but without the homeopathic rituals like succussion. Give the final third to a well-equipped, well-staffed biochemistry lab. Get them to fractionate the fluid by HPLC or FPLC, and then test the fractions for biological activity in a suitable assay, and identify the molecules present are responsible for the effect, (assuming it’s not some arm-wavy, unsubstantiated guff about the vital force or EM fields) they will presumably isolate one or more fractions that contain the molecules responsible for the therapeutic effect. These molecules could then be purified for trial in patients. If only the homeopathic remedy recapitulates the results of the DBRCT, then homeopathy works. Elseif, science works, and someone just got lucky feeding diluted extract of scabies blister to cancer patients.